Some weeks can be a bit mad, with events back to back and travelling time mounting up. This last 10 days were like that, so I thought I’d share some of the truly wonderful things that have happened with you! 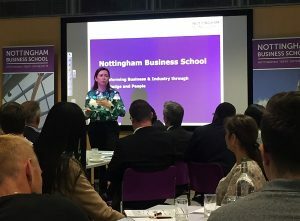 Last Wednesday (6th Sept) I arrived at my old University – Nottingham Trent, to attend an event put on by the Nottingham Business school. I became an Alumni Fellow, which means that I’ll be working alongside Students on projects, I could go in to do some guest speaking and I become a Mentor to a Student to give them context to what they’re learning in lectures. I feel really passionate about being an Alumni Fellow of the University. I look forward to presenting them with an insight into life after University and explaining that once they leave it’s very much a learning curve, and there’s not necessarily a direct path to their final career, they’ll possibly still need to find their feet. Well, that has been my experience anyway! Here’s Melanie Currie, Deputy Dean of the Nottingham Business School opening the event. The following day I had organised a photoshoot session for 5 members of the Wire Doves. 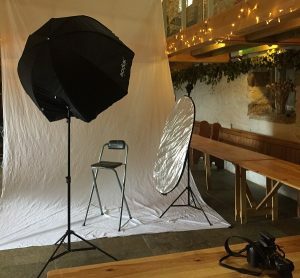 We had a the delightful duo of Photographer (Brett Trafford) and Make-Up Artist (Esther Marie) and the perfect location of Sue Prince’s Beechenhill Farm in Derbyshire, as you can see from the pic we had all the professional gear on the go! The objective of the day was to generate professional ‘head shots’ for these ladies in business, to use on their social media profiles and on their websites. It was a really successful afternoon. We had such a good giggle whilst the shoot took place, and all 5 ladies (plus myself) were very excited by the end results, so we’ll be showcasing those very soon! By Friday I was ready for an event I had been planning for most of the year – a Dignity Project fundraiser for Kenya. For those who have heard me talk passionately about the project to raise money for pants and sanitary pads in Western Kenya you’ll be well versed. If you haven’t, check out my page all about Kenya. The Renew Church in Uttoxeter is home to the One By One charity that runs the Dignity Projects, and they have a great theatre space, so it was the natural place to hold the fundraiser. 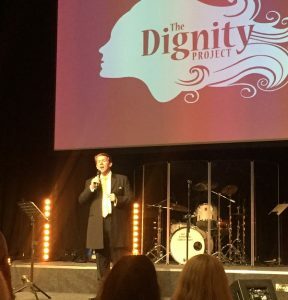 The evening raised a staggering £835 for The Dignity Project in Kenya, which takes my total to nearly £3000 raised for the charity. If you didn’t get chance to come along, you can hear Jack Foley sing for yourself, let me know what you think – he gives me shivers down my spine! It was a pretty poignant evening for my family too, as it was my Grandma’s 81st birthday, and my Grandad was able to attend too, he isn’t too well at the moment, so that made it a magical evening for me. Saturday evening was another family fundraiser, this time it was in Ashbourne supporting my Mum Della with her charity calendar. Kay Platt and Caz Harris have created a Glitz and Glamour Calendar to raise funds for Derby Breast Unit and One Voice Gynaecological Support Group in Derby. So far, these two ladies have raised nearly £30k for the charities with their (now famous) glamour balls, which is such an incredible feat! 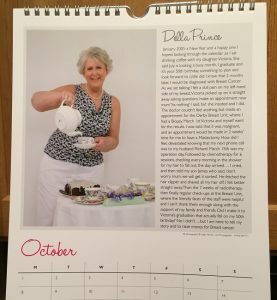 Each month, the calendar features a different lady from the Ashbourne area who has battled cancer. Mum was diagnosed with breast cancer back in 2005, and after surgery, chemotherapy and radiotherapy, she pulled through and became even more positive than she had been before. Yep, I think she’s pretty special! I’m proud to tell you that my Mum is ‘Miss October’ and her photo shows the cake baker she is. Have you ever tried her lavender cake with lemon drizzle topping? That’s the one in the picture! If you’d like to order a calendar, they are available from Kay & Co Hairdressers, Georgina’s, Sellers Jewellers, Best wishes, Acorn Country Store or Fresh choice (all located in Ashbourne) or get in touch with them via the link in the paragraph above. 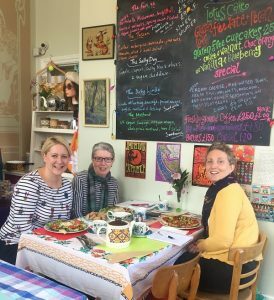 Yesterday (14th Sept) I met up with Lindsay Trevarthen and Vicky Fox, to discuss the forthcoming year of events for Wire Doves – a supportive networking group for Women in Rural Enterprise. We met in a new vegan cafe called Vegan Revolution in Belper and of course we had to sample the menu whilst we planned and brainstormed. We’re putting the final touches to the events, just need to confirm a few things first, so keep your eyes peeled on the Wire Doves Facebook page for all the details. It’ll be in the pinned post at the top. The next Wire event is Wednesday 11th October, hosted by Jackie Howard at Betty’s Sewing Box in Ashbourne, Derbyshire. October’s event is all about ‘Networking, News and New Members’ so we’re encouraging lots of newbies to come along and see how supportive everyone is – it’s not scary at all! It starts at 6.30pm and is £7 for members, £10 for non members and includes a light supper. Oh and yes, we just HAD to have vegan cakes to finish off the meeting. The lovely ladies who run the new cafe are Lise and Alex and we wish them every success and hope to see them at a Wire event soon! 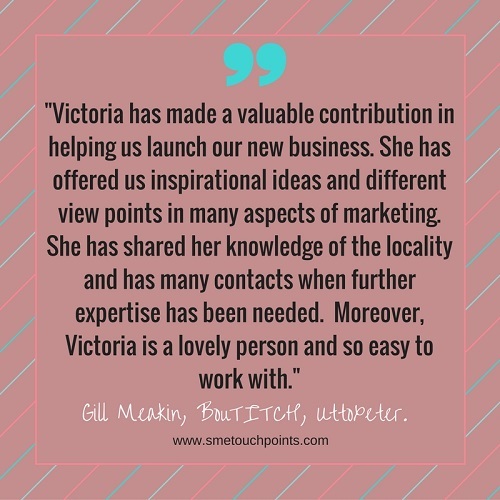 The other exciting news is that Vicky Fox is coming on board to run the network with me, as Lindsay steps down in the coming months – we’ll certainly still need Lindsay’s input for event titles every time! In between all of these goings-on, I’ve won the business of an exciting new client; a personalised gift wrapping company called Pretty Gifted. I’m excited to be managing their Social Media. Their unique selling point is that you can choose the background colour of the giftwrap, and write a message (up to 60 characters) and choose the font and colour of the font too! Pretty neat! I can see a lot of friends will be expecting special wrapping paper from me now, as standard! 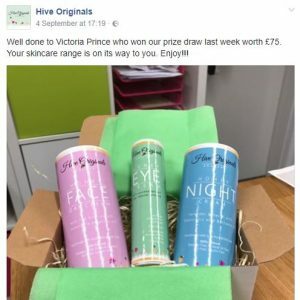 The other thing I won was a Hive Originals prize draw on Facebook! I already use their lovely Face Cream, so I posted an honest review when prompted, and voila, I was picked out of the hat! How exciting! So that’s arrived and I used the eye cream and night cream last night. Who knows, maybe I’ll turn out to be 10 years younger and no-one will recognise me. Ha ha. The final thing to tell you about, you may already know that the Soil Association have declared September as an Organic month. Well, my good friend Sarah Cross runs her own butchery Derbyshire Dales Organics, selling chicken, lamb, pork, making her own organic/gluten-free sausages and getting up at the crack of dawn to exhibit at Farmers Markets selling lots of her wares. Sarah is a special person, she’s a grafter for the love of organic and if there’s one thing you do this month that’s organic, simply like her business Facebook page to keep up to date with what’s she’s doing. Phew! Potentially, the typing of this blog was as epic as my week! 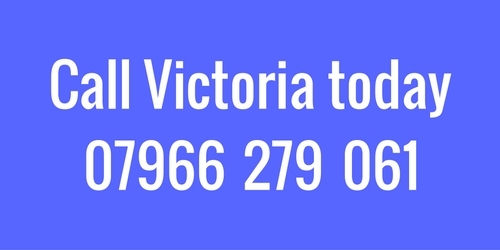 Fantastic, Vic! Keep it up. Love the Alumni mentoring thing – wish we’d had someone like you in to speak with us back when we were nervous undergrads stepping out for the first time.